Credit: Photo courtesy of the Canadian Ski Museum. (Credit: Malak Karsh) Anne Heggtveit. Through her accomplishments in alpine skiing, Anne Heggtveit set milestones for Canadian skiing and women in sports. Supported by her father, a cross-country ski champion, Heggtveit began skiing at the age of 2, winnning her first race when she was only 7. Aged 9, she placed second in the Ladies’ Slalom at the Central Canadian Championships. 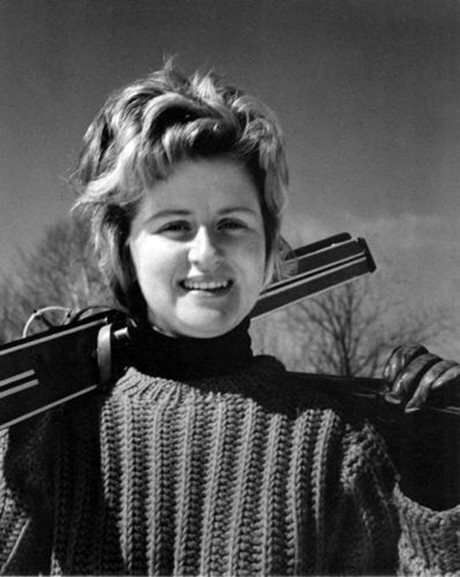 Between 1948 and 1959, Heggtveit dominated women’s skiing in Canada, the United States and Europe. Heggtveit won Canada’s first-ever alpine gold medal at the 1960 Winter Olympics in Squaw Valley, California. That same year, she won the Federation Internationale de Ski (FIS) gold medal for slalom and the FIS gold medal for the alpine combined events – previously never awarded to a non-European. Later that same year, Heggtveit won the Lou Marsh Trophy. She was named to the Order of Canada in 1976. Read more about Heggtveit – with photographs of her skiing – on the Canadian Ski Museum website. See artifacts on Canada’s Sports Hall of Fame website (winners of The Bobbie Rosenfeld and Lionel Conacher Awards). Listen to an interview with Heggtveit from the CBC Digital Archives, which aired on December 31, 1960.